The Schooner Pride is an 84 foot tall ship operating in Charleston Harbor. She invokes visions of when Charleston was a very prominent sailing harbor as our country developed. She is modeled after the 18th Century coastal trading schooners. Chicago’s only tradition Tall Ship, the schooner Red Witch offers ticketed events and private charters. USCG inspected for up to 49 passengers, sailing from Kenosha Harbor. 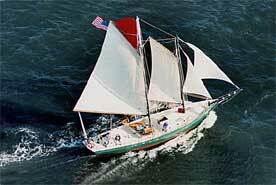 A 65 foot gaff topsail schooner, Coast Guard certified to carry 30 passengers for daysails. Operating from Yorktown. Sir Robert trips are more than a purely sailing adventure. From diving between shimmering coral reefs to culinary excursions to picturesque fishing villages: this is where you’ll be issued a licence for an unforgettable holiday. 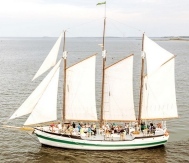 A three-masted, 80 foot representation of a 19th century sharpie schooner, used as a platform for learning and experience for both students and adults in Long Island Sound. A traditional working schooner, operated by Schooners North for trips in the San Juan Islands. 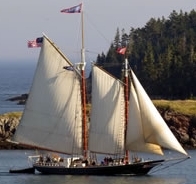 Launched in 1871, the Stephen Taber epitomizes the classic coasting schooner. Built in an era when highly skilled shipwrights built fine vessels to be aesthetically beautiful as well as functional, she stands as a proud tribute to American craftsmanship. Rockland, Maine. In a unique shipyard in Chestertown, Maryland, a group of dedicated craftsmen are reproducing the Schooner Sultana, an 18th Century American Schooner. Built in Myanmar, the new schooner Sunshine graced the Mediterranean last summer where she stunned the crowds of classic boat lovers as the latest Fife design to join them. 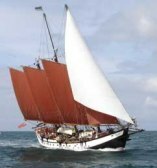 The oldest daysailing windjammer in Camden, we invite you to join us for two hours of adventure on board the beautiful schooner Surprise. Experience Camden and Penobscot Bay the way it was meant to be... from the deck of our 86 year old Gloucester Fisherman yacht. Picture yourself relaxing on the deck of this beautiful 65- foot schooner as she sails out of Gloucester harbor on a light southwesterly breeze. Help the crew raise the sails, or just sit back and take in the sights and sounds of Gloucester's coastline. The Schooner Welcome, 62 traditional wooden Concordia yacht. Schooner Western Union is the last wooden sailing vessel built in Key West and the Flagship of the City of Key West. Sailing charters aboard a classic 65-foot schooner yacht along Maryland to Maine, New York.